Dr. Sundeep Shukla expected his patient would be upset to learn that he was stuck in the emergency room indefinitely. There was no psychiatric facility that had space for him. But Shukla did not predict what happened next. The patient leaped off his gurney and punched Shukla, hard, in the jaw. Pain shot down his neck. Shukla, who now works at a hospital in Western Massachusetts, had little time to nurse his wound: Another ambulance arrived and he rushed off to treat a stroke patient. Angry and distraught patients and family members have scratched, spit at, bitten, hit, and stabbed doctors and nurses working in hospital emergency rooms. One Massachusetts caregiver was so badly cut in an assault that she required eight hours of life-saving surgery. Nearly everyone has a story. A new survey of more than 3,500 emergency physicians across the United States released Tuesday suggests this type of violence against hospital emergency room staff is growing worse. Assaults against nurses have been well-documented, but this is one of the largest surveys of physicians. Nearly half of doctors said they have been physically assaulted on the job. About two-thirds of those doctors said they were assaulted in the past year. Seventy-one percent said they have witnessed an assault on the job at some point, according to data from the American College of Emergency Physicians, based in Texas. And nearly 70 percent said violence has increased in the past five years. The survey, which was conducted in August, included 112 emergency physicians in Massachusetts, one of the top 10 participating states, and their responses were similar to those nationwide. The report comes as debate here has intensified over whether hospital administrators are doing enough to prevent violence against employees, and a few hospitals have taken the unusual step of installing metal detectors. Some doctors and nurses argue that tough new laws are needed to force improvements and deter assaults. They say the violence hurts all patients seeking medical care, creating longer waits, anxiety, and distractions for staff. Dr. David Brown at Massachusetts General Hospital said emergency departments have become “sort of a cauldron for agitation,’’ where growing numbers of patients, many with psychiatric conditions or addictions to drugs or alcohol, contribute to crowded conditions and frustrating delays. At Mass. General and many hospitals, patients with mental health diagnoses are increasingly stuck in the emergency room for hours and even days because of limited availability of psychiatric hospital beds and other treatment options. “Patients are more anxious, and we’re more anxious.’’ said Brown, chairman of emergency medicine at Mass. General. Shukla said the patient who punched him several years ago was told by an outside therapist that if he checked into the emergency room, he would quickly be transferred to a psychiatric facility. “A lot of times, they get upset because they have nowhere to go,’’ Shukla said. He declined to publicly identify the New England hospital where the incident occurred, but he said he has seen violence regularly in other hospitals where he has taken family members for care and where he has worked. He is now an emergency physician at Baystate Franklin Medical Center in Greenfield. He has seen patients lash out because a doctor would not prescribe painkillers. Health care workers face a rate of workplace violence that is four times higher than in private industry overall. 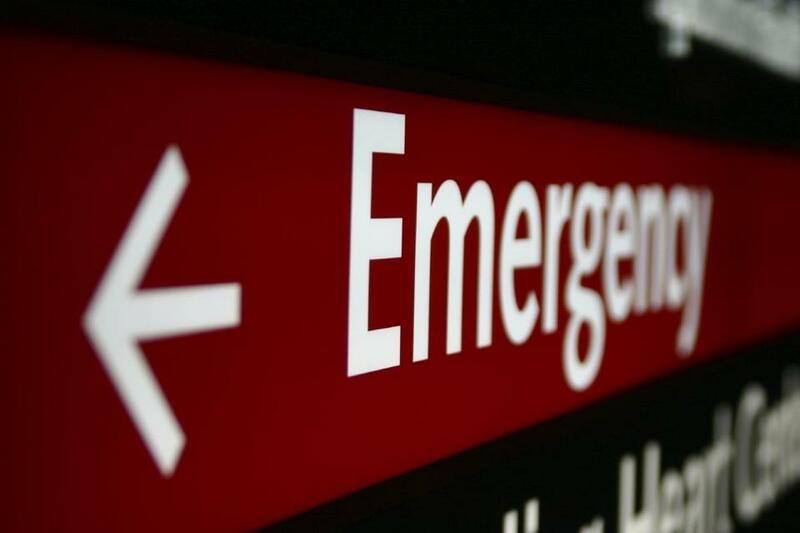 Emergency rooms are especially risky, but assaults can happen anywhere in a hospital. Three years ago, Brigham and Women’s Hospital surgeon Dr. Michael Davidson was shot to death in an exam room by the son of a deceased patient. According to the US Bureau of Labor Statistics, “intentional injury’’ by another person rose from 6.4 per 10,000 hospital workers in 2011 to 9.0 per 10,000 hospital workers in 2016, the most recent year of data. The rate across private industry is 1.7. Dr. Terry Kowalenko, chairman of emergency medicine at William Beaumont School of Medicine in Michigan, believes one reason for the rise is that employees are reporting incidents to hospital administration more often, facilitated by computerized systems that make it easier. Many caregivers, though, said they still are reluctant to disclose incidents involving patients whose reactions they believe are unintentional, such as those with dementia, for fear a patient seeking help will wind up entangled in legal problems. Doctors who responded to the survey estimated that police arrested the patient who committed the assault in about 20 percent of cases. Kowalenko, who has studied the issue for more than a decade, said he has been hit several times by patients, but the most frightening incident involved a threat from someone to whom he refused to prescribe narcotics. He recalled the patient telling him, “ ‘I know what time your shift ends, and I know where the parking lot is, and I will wait for you.’ I was really scared,’’ said the physician, who was escorted to his car by a security officer. Nurses generally provide more direct care to patients than doctors and are assaulted more often, Kowalenko said. According to a survey three years ago of 220 Massachusetts nurses by the Massachusetts Nurses Association, a labor union, 86 percent reported experiencing violence over the previous two years. Elise Wilson, a longtime nurse at Harrington Hospital in Southbridge, was the victim of an especially vicious attack last year. A patient who had previously been treated for wrist injuries at the hospital was still in pain. He heard voices urging him to seek revenge, said Dr. James Sullivan, chief of emergency medicine. When the patient arrived at the emergency department last June, Wilson was working triage. She led him into a small exam room to evaluate his condition. Suddenly, he pulled out a kitchen knife and repeatedly stabbed her in the neck and arm. The attack on Wilson, who has not been able to return to work because of extensive nerve damage, served as a wake-up call at the hospital. Harrington hired more security officers. Patients who verbally assault staff are now mailed letters warning they will be escorted to treatment by security next time they come to the hospital. Harrington installed metal detectors at emergency department entrances, and patients brought in on gurneys are searched using hand-held detectors. So far, the hospital has confiscated several guns and thousands of knives, Sullivan said. The attack on Wilson also prompted nearby UMass Memorial Medical Center in Worcester to install metal detectors at its Memorial and University campuses for “an additional layer of protection,’’ spokesman Anthony Berry said. Other hospitals, including Mass. General and those in the Baystate Health system based in Springfield, are increasing training for emergency department employees on how to recognize and defuse potentially volatile situations. Shukla said he is taking simple measures to create more personal rapport with patients, such as sitting on a bedside stool during conversations, instead of standing over patients. The Baystate system has decided against metal detectors, chief executive Dr. Mark Keroack said. Detectors are expensive, and most assaults don’t involve weapons. In the American College survey, emergency physicians nationally cited 36 cases of staff being attacked with a knife or similar weapon, and four cases of gun violence. Massachusetts emergency doctors reported two knife attacks and no gun violence. Others say more should be done. Many Massachusetts emergency physicians support passing legislation that would increase criminal penalties for assaulting a health care worker. The nurses union supports a bill that would require all health care facilities to annually assess the risk of violence, develop programs to minimize that risk, and allow employees who are victims of assault up to seven days’ paid leave. Liz Kowalczyk can be reached at Liz.Kowalczyk@globe.com. Follow her on Twitter @GlobeLizK.